The below begins a road trip I took out east in September of 2011. (I know, SHAME.) I convinced my husband that the largest VW show in the US would be much more fun than a drive west to see state parks, purely because the grilled cheese prospects west of WI looked positively dismal. This is the first (of nine) I ate on that trip. 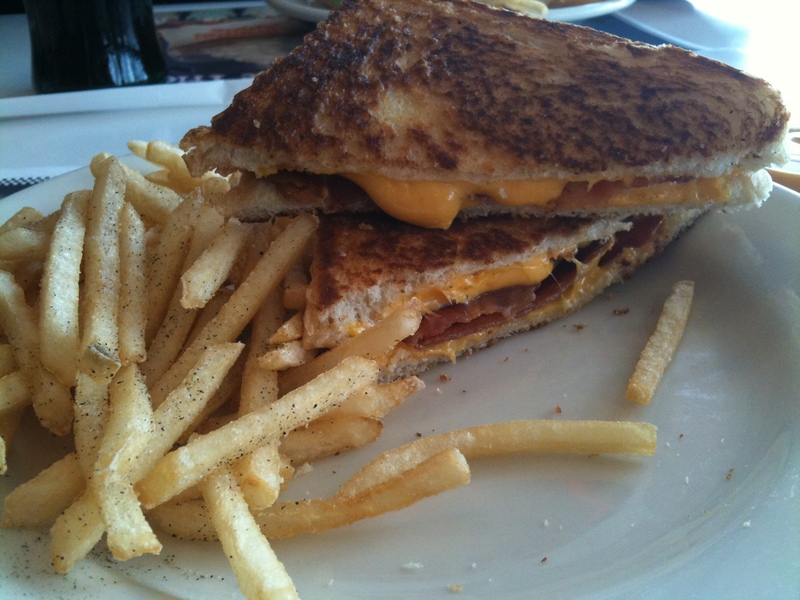 I enjoyed the above (Grilled Cheese + Bacon) in Elkhart, Indiana – day 1 of our trip. I’ve only been to a Steak ‘n Shake once before, but have always thought of it as fast food. It’s not. This wouldn’t have been that important, except that we were trying to catch up to a rally, and needed to make it to Pittsburgh(ish) by nightfall. They weren’t busy, but we managed to escape the wait staff’s radar for a full 15 minutes. When she discovered she’d neglected us, she was loudly, wildly (and embarrassingly) apologetic. From here, things moved quickly.